the United States Air Force Retirement Lapel Pin. 1. Your Character of Discharge at time of Retirement must be HONORABLE (no exceptions). 2. You must submit a photocopy of your Retirement DD-214. 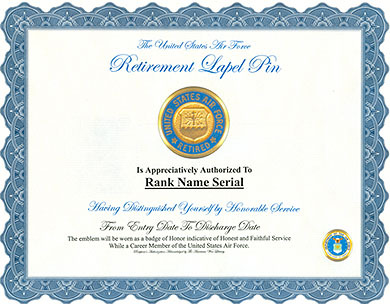 The US Air Force Honorable Retirement Lapel Pin is authorized to Honorably Discharged USAF retirees.This Lapel Pin may be worn on civilian clothes or on the USAF Retirement uniform. The pin is worn on the left lapel of the uniform, or may be worn on the left collar of civilian shirts/blouses.